The Wisconsin Department of Natural Resources (WDNR) is proposing to reissue the Wisconsin Pollution Discharge Elimination System (WPDES) permit for Babcock Genetics, a swine CAFO located in rural LaCrosse County. In recent years, the LaCrosse County Public Health Department has become increasingly concerned about high nitrate/nitrite levels found in private wells in the area which exceed the federal safe drinking water standard of 10 micrograms per Liter. 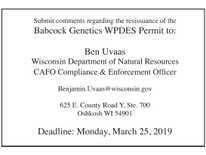 The WDNR held a public input hearing on the topic of whether Babcock Genetics WPDES permit should be reissued on Thursday, March 14, 2019 at the Holland Town Hall, and this video portrays some of the citizen input that was provided. Copy and Paste the URL below into your email, blog, or chat. You must be logged in to add this as a favorite. You must be logged in to rate this video.